Hockey season is in full swing and with that comes the entrance of smelly, dreaded odors that the sport leaves behind on hockey gear and equipment. The sport is played in an ice arena – which may lead you to believe it would eliminate the amount of sweat that the athlete produces, but contrary to belief, the cooler temperatures are no match for the heavy production of sweat that each athlete creates during the game. Hockey is not only a vigorous sport on the ice but also at home in your laundry room where you are fearlessly trying to beat the stink of hockey funk! The hardest part about deodorizing gear from this sport is the difficulty presented when trying to wash every item that is used in each game that is played – such as helmets, pads, gloves, and other protective equipment. Stinky hockey equipment is, unfortunately, fairly common and learning the best tips on how to deodorize your funky hockey gear and wash your hockey equipment can help not only preserve expensive hockey gear but also help save your nose from the strong and unwelcome odors that are associated with the sport! Below are the best known (or maybe to you unknown) steps to take to finally eradicate those pungent odors from your athletic apparel like hockey gear. Stinky sweat odors, especially hockey sweat is nearly impossible to stop – no matter what you do, whether you have the strongest deodorant possible or try every magical solution you can find to stop the production of sweat from building on your clothes and gear. One trick to implement to try to mitigate that dreaded “hockey stench” is to layer up! Suiting up in your best under shirt and clothing protection will help to alleviate the accumulation of sweat on your athletic gear. The under-clothing works by absorbing the moisture, thus acting as an extra layer of protection from your gear and padding – reducing the buildup of sweat. After you have broken a sweat in your hockey gear one of the best things you can do is to bake your clothes outside in the sun and fresh air. If you leave your sweaty, damp clothing in your climate-controlled home not only will the odors become magnified but the potential for mold to grow as well as bacteria to build on these items increases drastically. 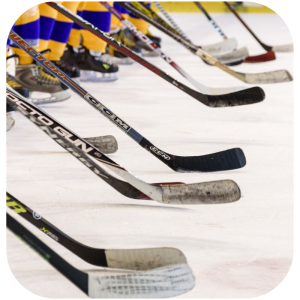 By allowing the hockey items to sit outside in the heat and fresh air it will help to expel or minimize some of the growing odors that build on the gear. 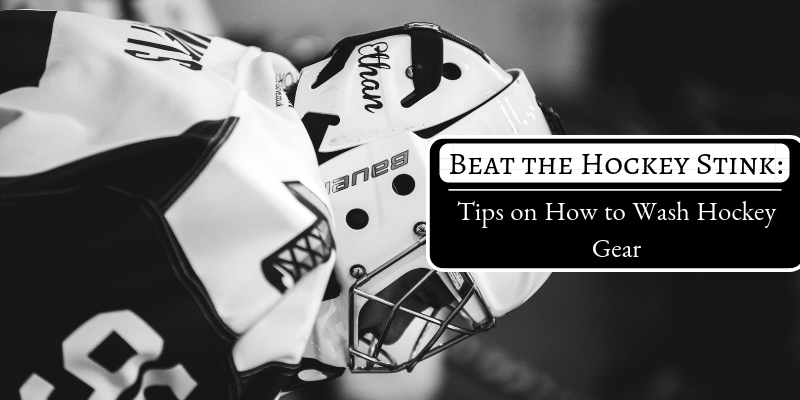 *Tip: Hockey equipment that passes the ridiculously smelly test can be rinsed by filling up the washing machine, allowing the items to soak, and then placing them in the washing machine on a rinse cycle. Determining the different gear that can be washed and the ones that cannot be washed can help you to decide the course of action for each item in your deodorization attempt. What Hockey Equipment is Machine Washable? What CANNOT be Washed in the Machine? Often enough, most hockey players will carelessly leave their gear sitting in a dark enclosed hockey bag for the odors to attack and permeate – sticking the player with an odor problem that is out of this world! Odors will accumulate overtime and lead to a stank that many players fear there is no resolution for this expanding issue – especially on gear that you don’t want to wash or that you simply can’t wash.
OdorKlenz is the ultimate solution for pungent sweat odors on apparel & gear for athletes. OdorKlenz utilizes a patented technology that is able to break down and neutralize sweat odors stuck in athletic gear – rather than masking the odors with a fragrance like many other odor eliminating companies. Sport odors can be difficult to remove especially from big athletic gear and equipment that cannot be easily washed in the machine – and OdorKlenz understands this issue and has created dedicated sport products for challenging sweat odors. Hockey players can easily deodorize their large gear with the OdorKlenz Sport Powder. The OdorKlenz Sport Powder provides an easy application for odor-elimination, simply flip the top and squirt onto the gear that you need to beat the stink out of – literally! The fast-acting technology will quickly expel the odors from the hockey gear with ease – so you can ditch the long hours of washing!